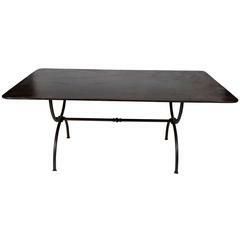 New extendable dining table for indoor and outdoor with wood top and iron structure. You can choose the color, the color structure and the measure. Table measurements: 49.60 in x 31.50 in ( with two leaves includes, each leave it´s 15.75in ) Total extending: 81in $2400 57.48 x 31.50 in ( with two leaves includes, each leave it´s 15.75in ) Total extending: 88.48in $2700 65.35 x 31.50 in ( with two leaves includes, each leave it´s 15.75in ) Total extending: 96.85 in $3200.